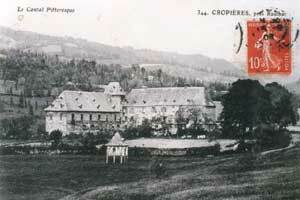 C. de Chefdebien inherited Cropières into 1976 his/her dependent mother Valady. After having ensured itself that his/her Hugues son would take his continuation it the naked-property gave some him. Very anxious by the dangers of new collapses, it tried to gain with the Middle East, what to undertake essential work of consolidation. Alas! after a few prosperous years, the brutal fall of the courses of the crude oil involved the rupture of many contracts, the closing of its company of irrigation and paysagism and the loss of all the benefit. 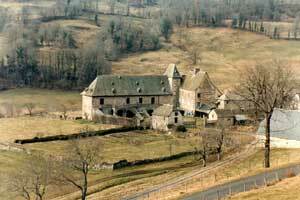 Not being able more to face the essential expenditure to save Cropières, it created with his son the ASC (Association for the Safeguard of the castle of Cropières). Their idea was to multiply, thanks to the gifts of its members, the modest funds of which they laid out by investing part of those in this association instead of devoting them directly to work of consolidation in order to be able, thus, to realize some more. They thus take charges all the expenses of them of the association of which all the receipts are assigned to the payment of work of safeguard approved by the State. Because of its classification like Historic building, the State deals with half of the cost of committed work but with height only of the contribution of the private one. The Architects of the Historic buildings decide those, choose the companies and supervise their realization. A first study financed for half by the Ministry for the Culture and the owner (34 500 francs each one) estimated at approximately 5 million francs the value of the the works of consolidation. The first (200 000 francs) was carried out without the assistance of the ASC. It made it possible to eliminate the risks of immediate collapse by the installation of stays and ties (disgracieux alas!) as well as the setting in sure place of the woodworks and paintings which remained in the large room. The second (500 000 francs, including 250 000 paid by the ASC) was finished in 1998. It made it possible to consolidate the Northern Wing definitively. A third section of 3,5 million francs had been envisaged by the Ministry for the Culture, which asked for to the owner an amount of 80.000 francs like participation (50%) in the expenses work study of this phase. In front of impossibility of joining together the share of private of this work (1,75 million francs) the owner asked the Historic buildings that this project be abandoned, that the 80.000 francs are assigned to work complementary to consolidation and that the complete repair of the monumental staircase is programmed (cost: 600000 frs to divide 50/50%). These three points were accepted. Obstructed to receive contributions without counterpart, C. de Chefdebien wrote two novels which are exclusively reserved to the members of Association. They are numbered and dedicated by the author. Third is in the course of drafting. First is based on real facts which had Cropières for framework at the beginning of the XVIIème century.